Just wondering if anyone has looked into a sight gauge mod for it? I can't seem to find much stumbling around the google machine. Is there a good reason not to do it? besides drilling holes into that expensive piece of tin? Why would you do that for - you have volume indication on the central rod - and that is the only reason I can think of. That is true, but from my understanding it's only in 5L increments? Leaving it a lot up to "best guesses". It's just another bit of bling to add and I know there were other ways to check the volume, but wasn't sure if someone out there had given it a go just because it can be done. I will post a pic of what I use when I can work out how to post pics on this forum. I made these and they just sit on top of the edge of the kettle. And I got the spare one!! Cheers Dicko. Works a treat, just gotta make sure the BM is perfectly level. I was scratching my head over volumes and hitting targets for a while until I remembered this. I very carefully weighed and measured my water today as it went in to the BM as I was still a little unsure on my volumes. Turns out the measuring stick Dicko made isn't exactly calibrated for my BM. No fault of his - I have no doubt it was perfect for his BM, but mine being a different model may have very slight variations. The result was that when I was measuring 29L, it was actually 28L. Hopefully now I can really nail my targets and finish fine tuning the software to suit. Dan wrote: I very carefully weighed and measured my water today as it went in to the BM as I was still a little unsure on my volumes. Did you measure with the malt cylinder installed? If I'm correct it has a displacement of about 1 litre. niels wrote: Did you measure with the malt cylinder installed? If I'm correct it has a displacement of about 1 litre. I took measurements with and without the malt pipe when I first bought the BM and found it displaced 300mL when fully submerged. I don't take any volume measurements while the malt pipe is in as this would mess up BS's predictions, so my calibrating was done without. I had a bit of a chat with Dicko last night and we discussed that perhaps the measuring jug is a little out. I checked my scales with a 5kg calibration weight we use on our prawn scales (must be accurate and checked regularly), then weighed every 4L (4kg) addition of water to the BM while marking off my new measuring stick. At 4kg, the jug was reading about 4100mL, so over 40L that is a difference of 1L. But on a jug so large it would be easy to fall 20-30 mL either side of the line, and it still looks like it's right on. So there's the extra water there. Dan I have had a think about it this morning and I actually used a 1 litre chemical calibration jug for making those dipsticks. I will weigh and measure it later as I have to go work shortly. If you are using a 5 kilo weight to calibrate scales that have a maximum reading of 5 kilos then you may find that the scales may not read over the 5 kilo mark. So therefore if the weight actually weighed 5.1 kilos on your scale then it would still only read 5 kilos, thus giving you an inaccuracy. That slight descrepancy would still reflect in a 4 kilo reading and as you pointed out, would magnify over 40 litres. I am not saying that my measuring stick is 100% accurate but with the figures I get from Beersmith my efficiency would be through the roof if I dropped one litre of brewing water. If you got OG of 1050 at 29 litres and Beersmith predicted 1050 at 30 litres then your efficiency has gone down for that brew not up as you had thought. I'll get back to you when I get back from this job. The scales will read a little over 5kg to a point where it will say "error", so the calibration was no problem. It weighed 5.010, which is close enough I reckon. I was so particular about the water weights that I weighed each jug to 4.008kg. Dicko wrote: ..If you got OG of 1050 at 29 litres and Beersmith predicted 1050 at 30 litres then your efficiency has gone down for that brew not up as you had thought..
Dicko wrote: .. my efficiency would be through the roof if I dropped one litre of brewing water. .
Maybe I'm reading this wrong? - but I think this contradicts the above quote. Last edited by Dan on Sat Feb 22, 2014 11:07 am, edited 1 time in total. Ok, last night I checked my 1litre jug against my 5litre jug and there was a discrepancy. I then weighed the 1 litre and it was short of 1kg by 25 gramms which means that if my scales are accurate then I would end up with approximately the same results as you Dan whereby the dipstick will be out by 1 litre if extended to 40 litres. That then would mean that by using that measurement you would be actually be 800 mls less water in a total of 32 litres, and that would give you a higher mash efficiency than what Beersmith predicted as the total volume would be less than The BS formula. This makes your observations correct in the above posts. I was having trouble getting my head around these figures late at night and before rushing off to work yesterday. My figures above are only based on the results of my scales. Don't automatically trust a measuring jug even if it supposed to be industry accurate. Use accurate scales and weigh water for volume measurement for total brewing water accuracy. Don't trust any dip stick made by Dicko as they are proven to be innacurate. I hope this helps anyone wanting to calibrate accurately a sight glass or dip stick. Last edited by Dicko on Sat Feb 22, 2014 7:58 pm, edited 1 time in total. Dicko wrote: Ok, last night I checked my 1litre jug against my 5litre jug and there was a discrepancy. Distilled water is 1000ml to 1000g. Discrepancy can occur when water is a different density. I have had to have 600l fermenters calibrated for commercial brewing, and the Government standard would not allow for the brew house water to be used. 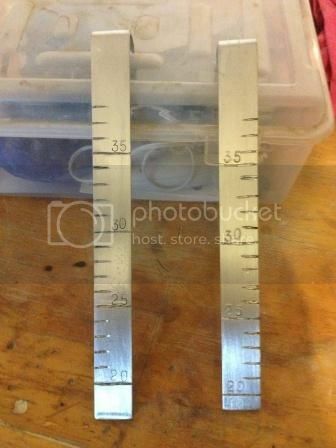 You can buy a accurate stainless steel ruler from most hardware stores and this is exactly what I use. Cant get simpler that this. You can make a small table with two columns "litres" and "cm". Print it out and have it laminated. You can make different table for your fermenter. Obviously you have to take the measurement from the same area. I measure from the centre.